Epson Exhibition Fiber Paper is a breakthrough paper, designed exclusively for use with Epson's UltraChrome K3 ink and was developed in collaboration with many of the industry's leading professional photographers to ensure it meets their most discerning requirements. Many who have contributed to the development of Exhibition Fiber Paper have commented that it not only reminds them of revered silver halide papers, but also offers greater creative control due to extraordinary D-Max and tonal transition in B&W and the ability to print extraordinary color with the same paper, something that was not possible to do with traditional fiber based papers. 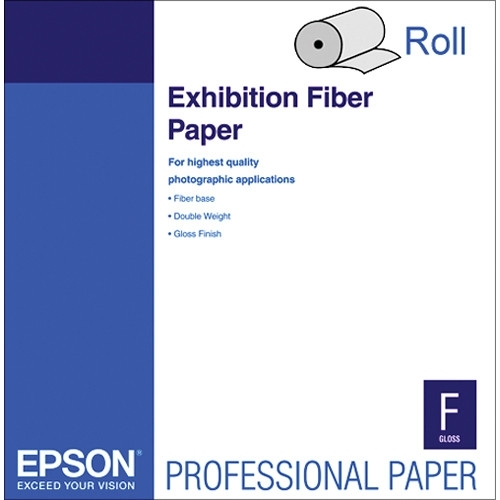 Like all of Epson's innovative media, this paper is engineered to give you the highest resolution and color saturation possible.